TopSpec is owned by experienced equine nutritionists whose only goal is to achieve excellence in every aspect of equine nutrition, from selection of the highest quality ingredients, creating innovative, excellent formulae, manufacturing to the highest European standards and providing the most comprehensive nutritional advice to clients. 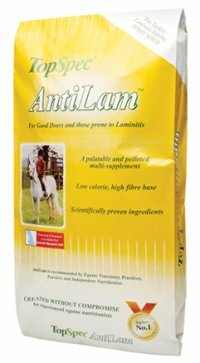 TopSpec AntiLam is a pelleted multi-supplement designed to provide nutritional support for those prone to, being treated for, or recovering from laminitis. TopSpec AntiLam is used and recommended by vets and farriers, helping to make it one of our most popular products. For example we would recommend that an overweight 12hh pony on box-rest because of laminitis should receive 125gms of TopSpec AntiLam plus 1kg of TopChop Lite twice a day in addition to 2.5kg (approx 1 flap) of late-cut meadow hay that has been soaked in ample fresh, cool, clean water, for about 12 hours before feeding. TopSpec Lite is designed for horses and ponies that need their weight controlled; they are usually gooddoers and may be overweight. These are the horses and ponies for whom every single calorie counts, and we do not believe you will find a lower calorie feed balancer anywhere. Lite is a ‘Non-Heating,’ cereal-grain-free, formula; with low levels of starch and sugar, and a considered level of protein to help maintain muscle function but avoid promoting body condition. It is very important that this group of horses and ponies receive their full requirement of vitamins and minerals. TopSpec Lite allows them to receive all the micronutrients required to balance the diet of horses in light to medium work in a small amount of exceptionally low-calorie feed. TopSpec Lite will help maintain excellent health whilst greatly improving hoof quality and promoting a supple skin and an exceptionally shiny coat. It is so palatable that it can be fed on its own, or with a little TopChop Lite. 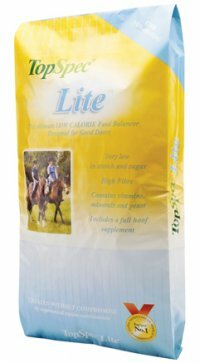 Long-term trials have shown that horses and ponies on restricted/poor grazing do not gain any additional weight when fed TopSpec Lite. It can also be used very successfully as part of a calorie-controlled diet when weight loss is required. them a ‘blend,’ because they are a blend of straight raw materials rather than a complete feed. One of the ways in which they are superior to most straights however, is that they have been supplemented with the major minerals calcium, sodium and magnesium. They are formulated without the use of any cereal grains and are very low in sugar and starch, resulting in a ‘NonHeating’ formula. Soya and linseed are added to support muscle function and repair. This helps to avoid the ‘fat but not fit’ situation which often occurs when good-doers are fed low quality high-fibre cubes, which often contain large quantities of alkali-treated straw. We guarantee that no straw is included in these cubes. TopSpec FibrePlus cubes are an excellent highly digestible fibre source for all horses. They can be fed dry or soaked in cold or warm water for up to 30 minutes to reach the desired consistency. Soaking is helpful for elderly horses, horses with problem teeth and horses that bolt their feed. 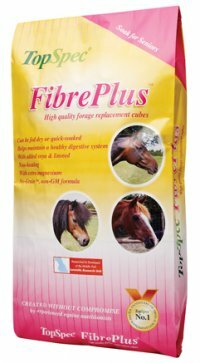 Feeding TopSpec FibrePlus cubes helps maintain a healthy digestive system. 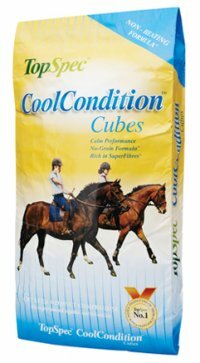 TopSpec CoolCondition Cubes provide ‘Non-Heating’ but conditioning calories and are ideal for horses that need condition without ‘fizz’. TopSpec CoolCondition Cubes are designed to be added to a TopSpec feed balancer or supplement and therefore contain no added vitamins or trace-elements. That is why we call them a ‘blend,’ because they are a blend of straight raw materials rather than a complete feed. Adjusting the rate at which TopSpec CoolCondition Cubes are fed will have no effect on vitamin and trace-element intake as these are supplied by the balancer used. One of the ways in which TopSpec CoolCondition Cubes are superior to most straights however, is that they have been supplemented with the major minerals calcium, sodium and magnesium. For example feeding these cubes instead of cooked barley/sugar beet, to working horses reduces or eliminates the need to add salt. TopSpec CoolCondition Cubes are our top-selling blend. They combine the brilliant properties of being seriously cool and seriously conditioning, this is a very rare combination. They are formulated without the use of any cereal grains, so they are not just ‘oat-free’ or ‘barley-free’ but completely cereal-grain-free. At the same time they have a good conditioning index of 12.5MJ/kg, equivalent to most cereal-containing conditioning compound feeds. The formula is very low in starch and sugar and high in fibre. The calories in TopSpec CoolCondition Cubes work equally well as a source of ‘Non-Heating’ energy for maintenance, for gaining condition or for performance. These calories are balanced for protein with high-oil soya and linseed, and with available sources of calcium, magnesium and salt added. • TopSpec Feed Balancers provide the perfect start to feeding a cereal-grain-free, low sugar/starch diet. TopChop Alfalfa and/or unmolassed sugar beet shreds often provide a limited amount of suitable additional calories but when more calories are required or simple cubes are preferred TopSpec CoolCondition Cubes provide the answer. • Ideal when extra condition is required and a ‘Non-Heating’ formula is essential. TopSpec CoolCondition Cubes can be mixed with any other horse feeds including a TopChop, various forms of sugar beet pulp, and compound cubes/mixes. Equestrian & Farm Feeds stocks a wide range of TopSpec but if there is anything which we don't have then we will order it in for you. TopSpec Comprehensive Feed Balancer is a very palatable ‘Non-Heating’ pelleted feed that is formulated without cereal grains and contains only low levels of sugar and starch. It contains many supplements combined with good quality protein to promote muscle development and topline. The supplements include a top-speciﬁcation broad-spectrum supplement and specialised supplements including a superb hoof supplement, generous levels of anti-oxidants and sophisticated digestive aids. This superb speciﬁcation allows horses to utilise far more nutrients from the forage and straights in their diet, which usually means that their hard feed intake can be reduced with many resulting beneﬁts. A complete speciﬁcation is freely available. TopSpec Comprehensive Feed Balancer is a very ﬂexible, nutrient-rich feed designed to balance the rations of most horses and ponies simply by adjusting the rate at which it is fed and the products it is fed with. 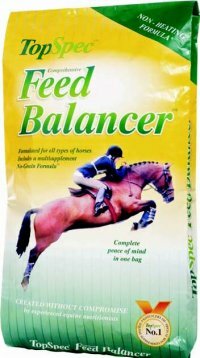 When TopSpec Comprehensive Feed Balancer is fed there is therefore often no need to add any further supplements, other than salt or electrolytes for sweating horses. The addition of e.g. blood tonics, yeast supplements/digestive aids, or hoof supplements is a totally unnecessary expense, ineffective and potentially harmful.